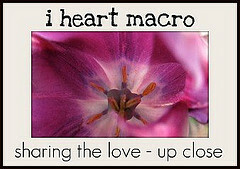 It's be a WHILE since I've be able to shoot out a I Heart Macro post. I didn't even gather any shots this week. Never fear! In my Macro folder, there are piles of shots that I just haven't gotten to share yet. So I figured I'll just go with some of those. The set today comes from a hike Pat and I took quite a few weeks back. The area is a little bay front park that used to be owned by the D'Olive family in Daphne, AL. While not much remains of them on the property, the family cemetery is still there to this day. That's where I directed my lens. 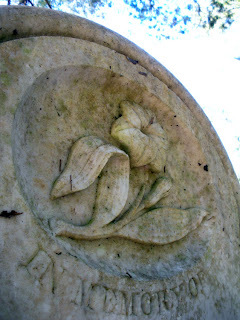 This marble carving is at the top of one of the headstones. It's the most elaborate headstone in the tiny cemetery. 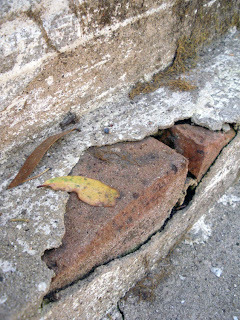 At the base of one of the headstones, the cement is beginning to crack away revealing the brick infrastructure below. This line of moss caught my eye. 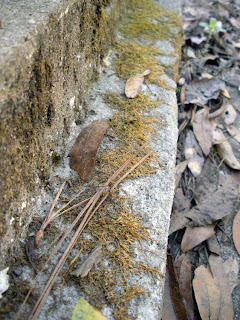 Check out more ultra close pictures with I Heart Macro Sunday hosted by Lori of Studio Waterstone. I think we're heading out for a bike ride down to the local Earth Day celebrations in a bit, so I ought to get myself cleaned up and ready to go! What are your plans to close out this weekend? Lovely carving on the headstone. I love old cemetery's. The headstones and markers are more beautiful than the modern ones. Great shots. I love old cemetery's, is that wrong? They can be very beautiful.